In total, there are four theme parks and two water parks in Walt Disney World in Orlando (EPCOT, Disney’s Animal Kingdom, and Disney’s Hollywood Studios, along with various yachting, beach, and golf resorts), while Disneyland in Anaheim, California, has only two theme parks and no water parks available. If you’re staying at the Disney Hotel, you can simply walk to the guest entrance. In fact, there’s a special entrance to Disney California Adventure from The Grand Californian hotel.You can take the monorail from Downtown Disney straight into Tomorrowland. If you’re at WDW, you’ll need to take the complementary system of buses, ferries, and a monorail system to get from your hotel to the various theme parks, around, and back again. Make sure you know the 15 items banned from Disney Parks before you book your trip. 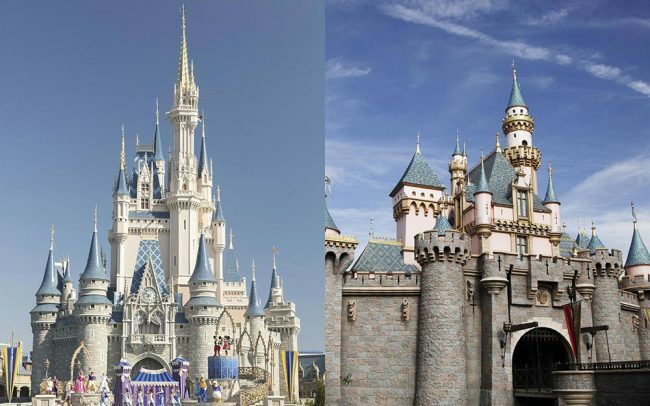 You’ll find Sleeping Beauty’s Castle at Disneyland, while the taller Cinderella’s Castle is the centerpiece of the Magic Kingdom at WDW. Check out magical, mind-blowing facts about Disneyland. This easy system to hold reservations for popular rides and attractions, without the hassle of waiting in long lines, is available at both parks. The Magic Kingdom offers Magic Bands, which are wristbands that allow you to electronically check-in to rides and attractions with a mobile app, while the park in Anaheim still offers FastPass paper tickets. Disneyland has a classic feel to it because it was the very first Disney theme park. Walt Disney slept at the park after long days at work and you might even find a longtime Cast Member or two, like Oscar Martinez, who actually knew Disney. While Walt Disney broke ground on Disney World, he did not live long enough to see it completed. He died in 1966, before it opened in 1971.